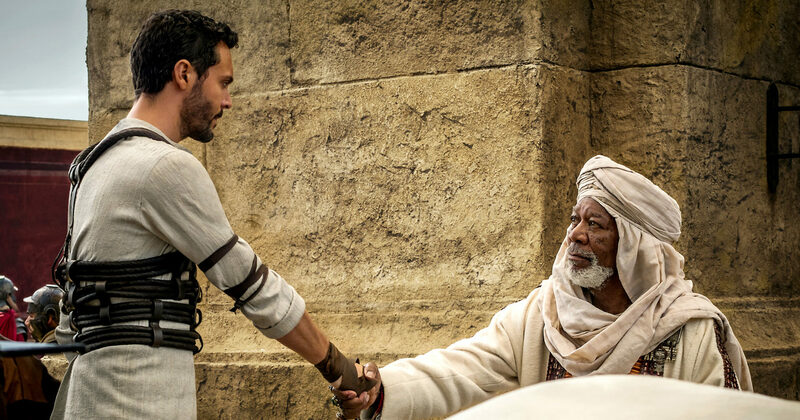 Quick overview: Judah Ben-Hur and his adopted brother are best friends until something comes between them, building a wall of hate too tall that refuses to be torn down unless revenge takes place and blood is shed. Okay, so I saw this movie with high hopes, but knowing that unless this version didn't meet the awesomeness of the 1959 version, then you wouldn't see me watching Ben-Hur 2016 again. Ever. I sat down knowing this and trying to keep my hopes at bay, and let me tell you - I was blown away people! Now *coughs* coughs* if I can stop this flying around review enough to get my thoughts collected into a more organized post. The acting is fantastic, Judah is played brilliantly, and was everything that I needed to see compared to Charlton Heston from the 1950s. Judah takes on a mad vengeance and determination, but at the same time is completely broken by the end of the film. 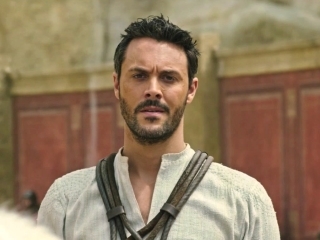 Jack Huston brings the movie to an amazing level. Messala (Toby Kebbell, who I had seen in Prince of Persia and War Horse), did a good job at being not only rash and at times violent but, unlike the old Messala character of the old edition, we got to know him a whole lot more and Korin said he is her favorite character. You saw where he is coming from, why perhaps he could have so quickly went onto the Romans side. Oh! And the cinematic action (I have to say) matched that of The Hobbit or any other high-action, battle movie. The chariot race was as awesome as you need, filled with high suspense and lots and lots of heart-dropping moments (think people flipping out of chariots, rolling under chariots, stuck under chariots, getting smashed against walls, etc, etc). The CGI is really hard to spot here too, which I'm so glad about. Usually nowadays there's so much computer generated imaging and action that it can sometimes feel more like a video game then a movie, but Ben Hur only has CGI where it's needed. Epic. I also have a new soundtrack to wear out on youtube while editing my book. Ben-Hur is a beautiful blend of Romanish, Biblical, sounds and I surprised myself by loving it - I wasn't a fan of the Prince of Persia soundtrack or Son of God so liking Ben-Hur's is surprising for me. It really blended with the movie and swept me into the action. Now the plot is a little different from the old version, but I think it's actually better that way. There's a whole lot more redemption here. The end defines the beauty of forgiveness and Jesus' love. Judah kneeling at the cross sobbing...so good! And for some reason ever since the watching the old version, Jesus giving Judah the cup of cold water and then Judah returning the favor later on during the crucifixion has really stuck with me. I could have cried if I wasn't still so tense from the chariot race. Now, grant it, this is a pretty violent film. 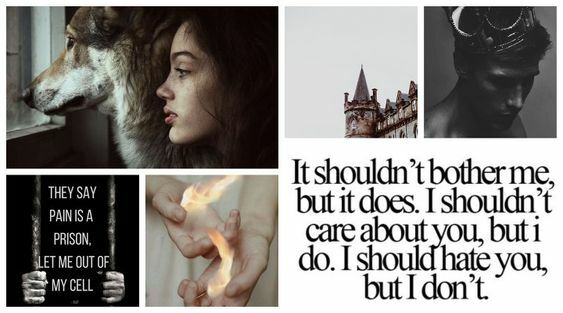 Like I said, people get smashed against walls, blood stains swords, and all that gruesome stuff, but I think it made the Roman world all that more real and the end - as I said - all that more beautiful. It made you see the kind of world that Christians in Roman times lived in without being overly grotesque. It was almost needed to bring forth the message. And can I just say - I love how the movie creators portrayed Jesus. I'm not one for Biblical films but this one was done right in my opinion. It's Kara approved. ;) Jesus isn't the main character and is rarely in it, which in a way made him seem all the more real. I liked it a lot. There was nothing really to point out and say, "hey that wasn't in the Bible!" Oh, and the movie could have been longer. I think that the stuff taken away from the original story could have easily been added grant it, it had been longer then two hours. However, I think the pace was fine and the deleted elements from the book was needed for the time frame. Overall this is an amazing, epic, inspirational, better then the 1950s movie! Watch it. What did you think of the movie? Or are you looking forward to checking it out? Oh and check out For King and Country's music video for Ben-Hur called Cease Fire - it's AMAZING. Okay, so I read the 2016 rewrite of the book, and I really enjoyed it (considering that I've never read the original version). So...now I'm interesting in watching the movie. I'm glad to know you like it! Thanks Kara, for writing this! YES watch the movie! =) It may be in the credits somewhere or on the soundtrack - I just know that the movie company made a music video for it. Thanks for your comment - I can't wait for you to see the movie. I've not seen this one, but will definitely rent it if nothing else. My family was sad to see it suffered such a poor result at the box office. But then I shouldn't be surprised. Anything that speaks of Christianity is often "shunned" (for lack of a better term). Yes, you're right. It's super sad that so many Christian movies are considered "not good enough" simply because of their Christian label.